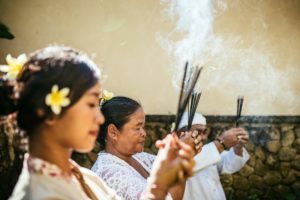 Immerse yourself in the healing magic of Bali where healing modalities have been used for centuries, handed down from generation to generation. They can serve as a catalyst to enhance mental, emotional and physical well-being. 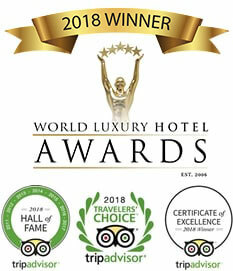 Part of being recognised globally as the world’s best luxury wellness retreat (World Luxury Hotel Awards) means you are in safe hands with our team of expert healers and leading healing programmes including Ayurvedia retreat packages. All of our healers have been handpicked by Janine and our team personally and are recognised leaders in their respective fields. In Bali the quality span of healers and healing retreats can be huge and daunting. At our luxury Bali retreat, we have done the hard work for you and hand picked those that are the very best in the industry. They embody the values of our Escape Haven yoga retreat brand being down to earth, warm, engaging and compassionate. Janine, our founder, has used many of these healers extensively over the years and the combination of many have led her to fertility in her 40’s having a healthy baby naturally at 42 and another on its way, which again she had naturally at 44. Our collection of healing practitioners are the real deal. You will experience a deep sense of inner peace wash over you as you surrender into your healing journey with us. Our healers range from Body work with Malcolm; Chakra Balancing with Putu, Ayurvedia with Ketut and Wati, Balinese healing and cleansing with Illuh through to Tarot and energy clearing sessions with Sylvia. All of these healing practitioners operate from the privacy of our healing centre on site. Our range of healers add something very special to your Bali retreat experience and are not to be missed. We also have in our little black book practitioners that we can recommend in accupuncture, oxygen therapy, medical beauty and anti ageing treatments, craniosacral therapy and nutrition. This Ayurvedic beauty regime helps firm skin as well as to improve your complexion. The application of all natural ingredients as a face pack is followed by a face, head and neck massage using herbal infused oil. It is suitable for all skin types and works well for wrinkles, uneven skin tone, sagging, and eyelash loss. Udwartana means to energize and elevate the whole body. A specially blended medicated powder that is home made is deeply massaged into your body using specific palm and finger movements. This treatment is performed to complement a weight loss regime as it tones muscles, stimulates blood circulation and reduces cellulite. By revitalizing the skin and sense of touch, it enhances youthfulness. The waist area of the body is called kati. A rectangular, leak-proof reservoir made of dough is built up on your lower back, around the lumbo-sacral area. Luke warm medicated oil is then gently poured in. The oil and the receptacle are kept in place for about 30 minutes and after removal, the affected area is gently massaged. It is beneficial for all spinal ailments, back pain and muscular discomfort. Known for its healing properties, this ancient therapy works at all levels to balance, calm and energise you physically, mentally and spiritually. We start by dry brushing the skin which increases circulation on the whole body then using heated bamboo we roll and knead the tissue. Stimulation of the tissue by the bamboo stick helps in getting relief by dissipating the heat that results from an accumulation of toxins and poor circulation. It improves the quality of sleep and helps insomnia. Known to increase mental clarity and cures depression it also increases lymphatic drainage and helps remove toxins from the body. Bamboo massage is known to also improve the texture of your skin. The silica from bamboo extract helps your body absorb essential minerals such as potassium, calcium and magnesium, which helps to minimize wrinkles. It’s the perfect mixture of beauty & pleasure. The leaves are collected freshly from our Canggu retreat. Most commonly used leaves are leaves of moringa and bevanda. They are chopped and tied in a linen cloth in the form of boluses. These are kept in a vessel containing the oil used to fry the ingredients and the vessel is then heated. An Abhyangam (a gentle oil massage) is given for about 10 to 15 minutes. Then the massage is given with warm boluses. The boluses are applied over the body. Your body is left feeling revived, warm and free of tension. Benefits include: Improves blood circulation, Improves skin complexion, Relieves body pain and stiffness, It is anti aging and rejuvenating, Reduces anxiety and stress and aids weightloss. 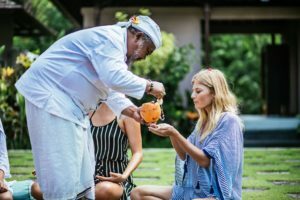 You’re in a safe environment at our Bali healing and wellness retreat; a yoga sanctuary for women that not only lets you enjoy the benefits of a yoga retreat – but also experience a wellness and healing holiday and spa retreat at the same time! Remember, this is your wellness spa holiday – there is no pressure to join all the activity programs. You choose how much, or how little, you do throughout your Bali retreat experience.